An ecclesiastical community was founded in St Asaph (Llanelwy) in the sixth century and the cathedral dates back to the 12th century. Unfortunately, St Asaph was located periously on the "warpath" of feuding Welsh princes and English kings. During the 13th century, the town was sacked several times and the cathedral badly burnt. 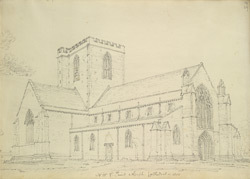 Rebuilding continued until the end of the 15th century, paid for by pilgrims visiting the shrine of St Asaph. Visiting the cathedral today, one can see the repairs made at various times to the exterior through the use of different types of local stone.